I want to generate a QR code! I want to decode a QR code! Want to customize your very own QR code? Try my QR Designer! 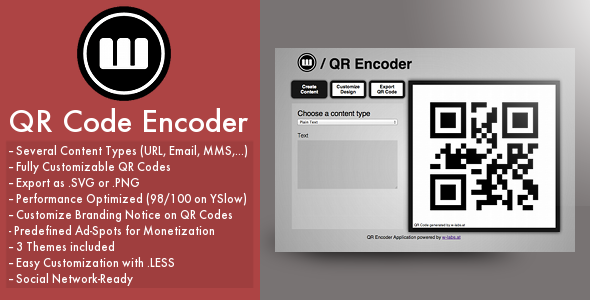 This app is for decoding and generating QR codes online, you do not need any browser plugins. Successfully tested with Firefox 3.6, IE7, Opera 10.53. Generate your QR code by simply writing some text in the textfield above and clicking "Generate". Make it even more awesome by clicking the other button! If you want to decode an image containing a QR code click on the correct tab and upload your image, the result will be displayed afterwards. If you like QRgen please consider flattering it! Big thanks to Zebra crossing, this app is using their QR decoding site for decoding your QR codes. I do not guarantee any resulting QR code generations or detections, use this application at your own risk! - this project is just a study project (non commercial). If you have any questions or suggestions feel free to send me a message. Sorry, we did not detect any code in your file. Try again?